I made my first generation machine in the early 1970's using an Edison Standard motor, base plate and mandrel with a Rabco arm altered to run "backwards" and fitted with a Pickering V15 cartridge to which I'd applied a miniature precision bearing ball for a tip. That machine has long since gone to the great beyond. My new machine utilizes an Edison base plate with drive at extreme left end (with new bearings fitted) to which I've connected the motor and servo from a Pioneer open reel tape deck for very constant drive and adjustable speed. I gutted an Akai linear tracking turntable for the arm and drive, which I also altered to run the "wrong way". My player is almost finished, but not yet fully operational. I just finished migrating all the parts from my prototype base where it was working, except for lack of stylus, to the custom designed solid oak cabinet where it's not working yet. I regulate the speed by inserting a 10 turn potentiometer into the servo circuit from the Pioneer tape deck electronics used to control the motor. 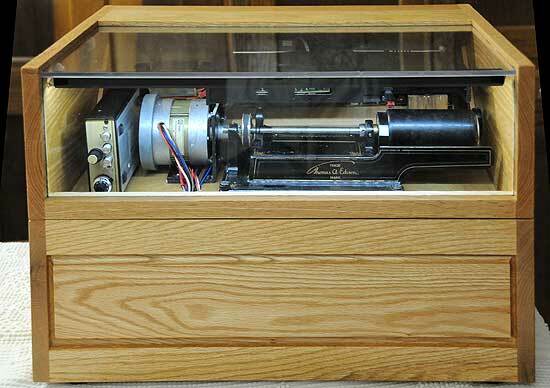 The deck had two speeds for the motor with a narrow range of adjustment within each speed. I'm using one speed setting for 160 rpm plus or minus for the mandrel and the other speed for 120rpm plus or minus. I hope to end up with 4 speeds: 120, 60, 160, and 80 rpm so I can play 2 and 4 minute cylinders at the appropriate speeds and 1/2 speed for each so I can play out of round cylinders without having the stylus jump out of the groove, then digitize the result and double the speed in the digital domain. I solved the tachometer dilemma by purchasing a digital laser non-contact tachometer on eBay from a company in China at a cost of only $13 with free shipping! It came with some adhesive reflective tape from which one applies a small square to the mandrel adjacent to the cylinder and then, when the mandrel rotates, the reflective square appears once each rotation and the laser reflecting off it sends pulses to the computer in the handheld device, which computes the rotation speed and displays it on its multi digit display. I think it's interesting that Edison chose to state on the lid of his cylinders "This record should run 160 revolutions per minute - not faster or slower" though I have no idea how anyone at the time could measure the rate of rotation of their phonograph mandrel! - except by ear, of course. I use a P-mount stereo cartridge for which I have not yet made styli, and the output of the cartridge drives the microphone preamplifier from the Pioneer tape deck for flat response and low noise. The output of the preamplifier will be directed to my Packburn noise reduction unit which has stereo line level input and mono output and samples both walls of the groove choosing the quietest one at any instant, reduces tics and pops and then passes the signal through a dynamic low pass filter. After processing by the Packburn, I'll feed it through a couple of cascaded defeatable 1/3 octave equalizers, one for 2 minute and one for 4 minute compensation, and then on to my main stereo system. 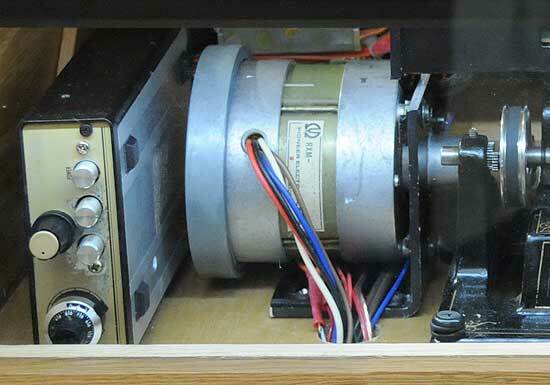 The Pioneer tape deck motor and speed control box.